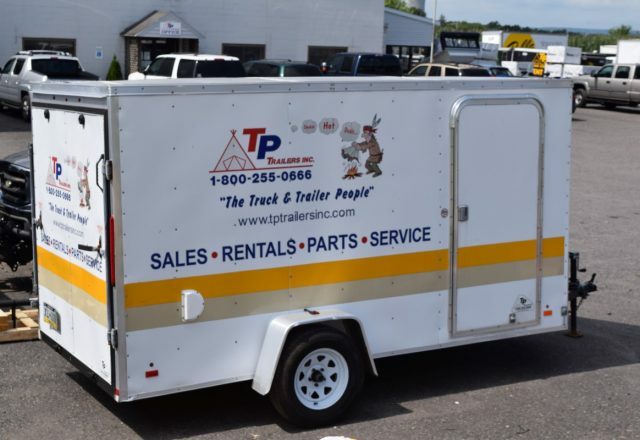 Trailer Rentals | Limerick PA | T.P. Trailers, Inc.
T.P. 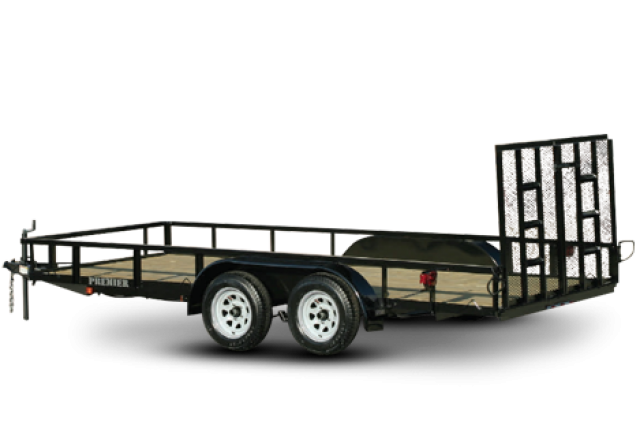 Trailers, Inc. offers two-way pull-behind trailer rentals from Limerick, Pennsylvania. Our daily rental fleet consists of car haulers, utility, motorcycle, ATV, landscape, dump, equipment and moving trailers. No matter what your hauling need is, we have the solution. These trailers rent by the day, week, weekend or month. Our daily rental trailers range in length from 6’ x 12’ up to 8.5’ x 24’ and are serviced and maintained after every trip. These units all come with a spare tire and wheel and we also provide rental item options such as, straps, wheel chocks, and tie down rings. We also offer commercial road trailers that range from 28’ to 53’ long. 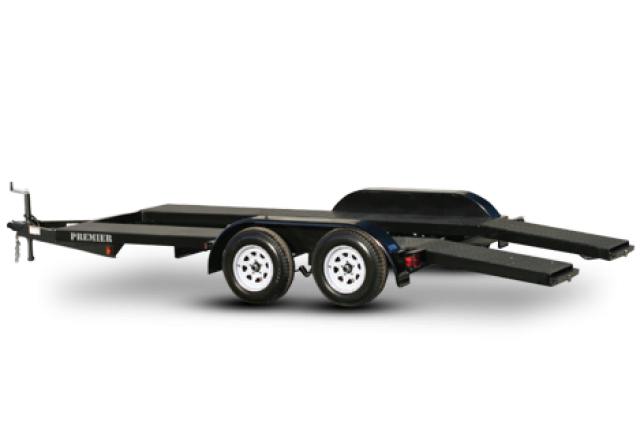 Please click the applicable link below to direct you to pull-behind trailers or commercial grade road trailers. 6’ x 12’ Enclosed Trailer, GVW 2,990 LB. Our enclosed 6’X12’ rentals can be used for moving and hauling furniture, ATVs, motorcycles and many other uses. This trailer can hold up to two motorcycles, it is equipped with removable wheel chocks for motorcycles and a ramp door for easy loading and unloading. This unit is set up to us tie downs on the walls and floor. It is available for rent by the day, week, month or weekend. **Must provide proof of current insurance on tow vehicle, valid driver’s license, registration, and a $500.00 security deposit via cash or credit card. Owner of tow vehicle and insurance policy must be named and sign the rental agreement. A $100.00 non-refundable deposit is required and a signed credit card authorization form is required; the deposit will be applied to the rental cost. 7’ x 14’ Enclosed Trailers, GVW 7,000 LB. Our Enclosed 7’X14’ rental is perfect for moving, and hauling furniture, ATVs, motorcycles, lawn equipment, construction supplies and many other uses. This trailer is equipped with removable wheel chocks for motorcycles and a ramp door for easy loading and unloading. This unit is set up to use tie downs on the walls and floor. Gain easy access to your supplies with a side door as well. This trailer is available for rent by the day, week, month or weekend. The 7′ x 14′ trailer is a tandem axle trailer with electric brakes and require a 7-way RV plug, 2 5/16″ ball and a brake controller on the tow vehicle. **Must provide proof of current insurance on tow vehicle, valid driver’s license and a $500.00 security deposit via cash or credit card. Owner of tow vehicle and insurance policy must be named and sign the rental agreement. A $100.00 non-refundable deposit is required and a signed credit card authorization form is required; the deposit will be applied to the rental cost. 8.5' x 16' Enclosed Trailer, GVW 7,000 LB. Our Enclosed 8.5’ x 16’ enclosed trailer rental is perfect for moving, hauling furniture, ATVs, motorcycles, lawn equipment, construction supplies and much more. This trailer is equipped with removable wheel chocks for motorcycles and a ramp door for easy loading and unloading. These trailers are set up to use tie downs on the walls and floor. Gain easy access to your supplies with a side door as well. They are available for rent by the day, week, month or weekend. They are tandem axle trailers with electric brakes and require a 7-way RV plug, 2 ” ball and a brake controller on the tow vehicle. **Must provide proof of current insurance on the tow vehicle, valid driver’s license and a $500.00 security deposit via cash or credit card. Owner of the tow vehicle and insurance policy must be named and sign the rental agreement. A $100.00 non-refundable deposit is required and a signed credit card authorization form is required; the deposit will be applied to the rental cost. 8.5' x 20' Enclosed Trailer, GVW 7,000 LB. Our Enclosed 8.5’ x 20’ enclosed trailer rental is perfect for moving, hauling furniture, ATVs, motorcycles, lawn equipment, construction supplies and much more. This trailer is equipped with removable wheel chocks for motorcycles and a ramp door for easy loading and unloading. These trailers are set up to use tie downs on the walls and floor. Gain easy access to your supplies with a side door as well. They are available for rent by the day, week, month or weekend. They are tandem axle trailers with electric brakes and require a 7-way RV plug, 2 ” ball and a brake controller on the tow vehicle. 8.5’ x 24’ Enclosed Trailers, GVW 10,000 LB. Our Enclosed 8.5×24’ V front units are perfect for car and motorcycle transportation. These units are equipped with a ramp door and beavertail for easy loading and unloading of sports cars and other high end vehicles. 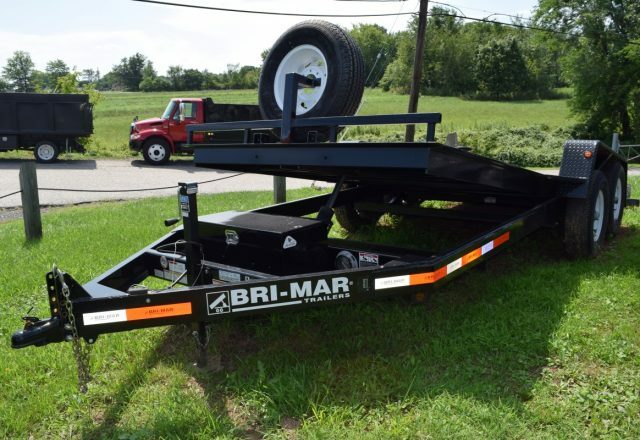 This trailer is also perfect for hauling motorcycles and ATV’s, it is equipped with motorcycle wheel chocks and tie downs on the floors and walls. If you are in the process of moving to another location this trailer will get the job done with easy tie downs and a comfortable ride for your house hold goods and furniture. This trailer is available for rent by the day, week, month or weekend. It is a tandem axle trailer with electric brakes and requires a 7-way RV plug, 2 5/16” ball and a brake controller on the tow vehicle. 6 x 12 Dump Trailer, GVW 10,000 LB. Our 6’X12’ Dump trailer is perfect for commercial and residential uses. It is capable of hauling, stone, dirt, mulch, concrete, roofing material, and many other materials. This trailer dumps hydraulically and can make any job easier. It is available for rent by the day, week, month or weekend. It is a tandem axle trailer with electric brakes and requires a 7-way RV plug, 2 5/16” ball and a brake controller on the tow vehicle. 16’ Landscape Trailer, GVW 7,000 LB. 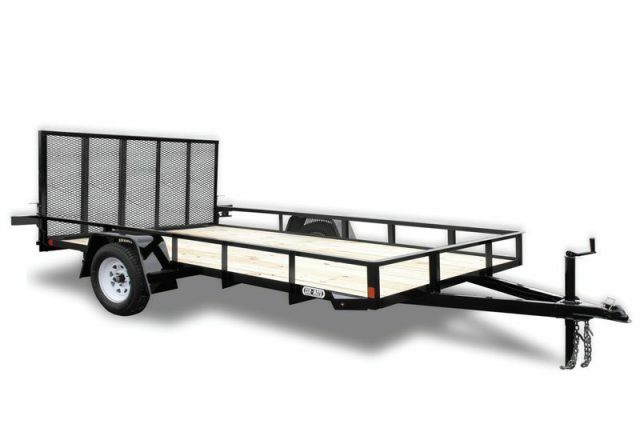 This trailer is perfect for landscapers and contractor uses. It is mostly used for hauling construction material and lawn equipment from location to location and has a mesh ramp gate and multiple tie down areas. You can also use this trailer to haul ATV’s and UTV’s.This trailer is available for rent by the day, week, month or weekend. It is a tandem axle trailer with electric brakes and requires a 7-way RV plug, 2 5/16” ball and a brake controller on the tow vehicle. 16’ Open Car Trailer, GVW 7,000 LB. If you are looking for a car hauler but do not want to pull an enclosed trailer around, this trailer is the one for you. It is lightweight and easy to load and unload, this trailer has 6 tie downs rings and slide out ramps. This trailer is available for rent by the day, week, month or weekend. It is a tandem axle trailer with electric brakes and requires a 7-way RV plug, 2 5/16” ball and a brake controller on the tow vehicle. Our 6’X10’ open utility is perfect for residential or commercial use. This trailer is often used for hauling small mowers and garden tractors, as well as other tools and equipment. This trailer has a mesh ramp gate and easy tie down areas. This trailer is available for rent by the day, week, month or weekend. 6 x 18 Tilt Trailer, GVW 10,000 LB. Our 18’ tilt trailer can be used to haul, skid loaders, mini excavators, small backhoes and scissor lifts. The deck of the trailer tilts for drive on loading and unloading of your equipment. It is equipped with multiple tie down areas and the tilt function is hydraulically controlled. This trailer is available for rent by the day, week, month or weekend. It is a tandem axle trailer with electric brakes and requires a 7-way RV plug, 2 5/16” ball and a brake controller on the tow vehicle. Our Dry Van Road Trailers are perfect for hauling your goods! These trailers are available from 28’ to 53’ and are Dock height which makes loading and driving away easy! They are great for on-site storage, too! These trailers are offered with roll doors or swing doors and are available for rent or purchase. Rent by the week or month; long term rental options available, please call to speak with our rental representative. **Must provide certificate of insurance naming T.P. Trailers, Inc. as additional insured and loss payee. "I have used T.P. Trailers on multiple job sites for storage. They have always been very prompt on delivery and pickup. 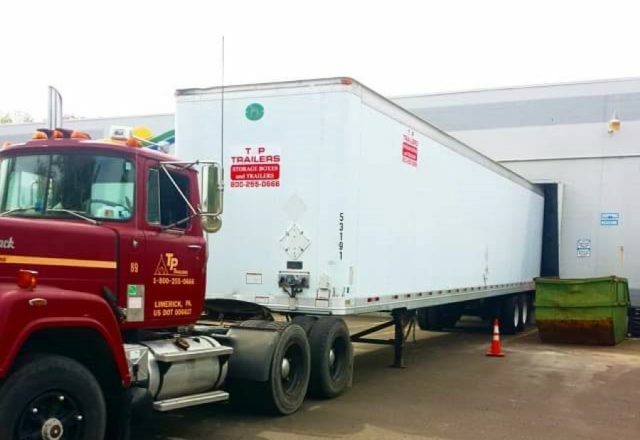 The delivery drivers I have had are very nice and willing to do whatever is needed to make sure that the trailers are in the proper locations and set up correctly."